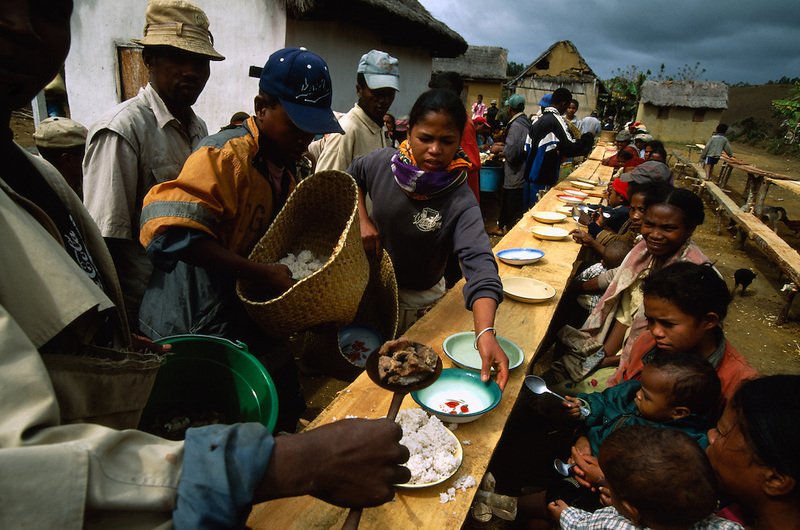 Guests attending a reburial ceremony in Belaveno, Bezanozano Ethnic Area, Madagascar, are served food by the host family. The famadihana, the Madagascan reburial ceremony, is a custom in the highlands of Madagascar. The purpose of the ritual is to induce the ancestors to impart their blessings to their descendants, as without those blessings one cannot have a good life. The famadihana is held during the cooler half of the year, when the dead are said to be freezing in their graves and therefore need new clothing. Copyright © 2005 Anders Ryman. All rights reserved.